The Nilfisk Neo is perfect for small places and confined spaces. 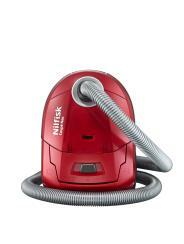 In fact it is the perfect choice for your first home because it is a lightweight and small vacuum cleaner. The high manoeuvrability means that it practically follows you even into the most awkward and small of areas. This robust supercharged little vacuum cleaner comes with effective cleaning power delivering an impressive 750W motor power ensuring a high dust pick-up and a healthier cleaner home time after time. The Nilfisk Neo is especially good in small homes like apartments because of its size.